Interact Medikal Teknolojileri A.Ş., a venture founded by Faculty of Engineering and Natural Sciences Members Esra Erdem and Volkan Patoğlu to transform technologies developed in cognitive robotics and human-machine interaction labs to medical products that improve people's lives, won the Special Jury Prize in the Micro-Scale Company/Product category of the 13th Technology Awards given by TÜBİTAK, TTGV and TÜSİAD with their project titled "AssistOn Rehabilitation Systems". 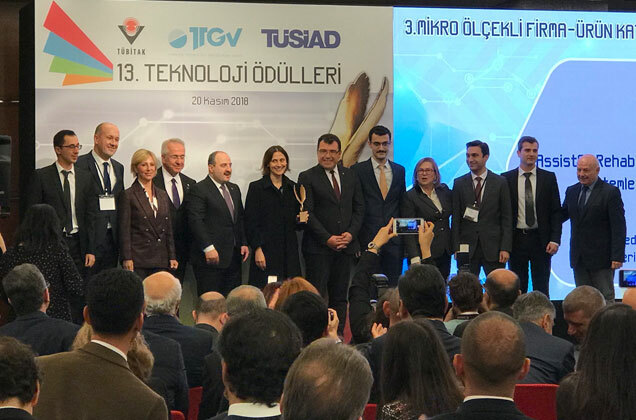 The 13th Technology Awards, endowed by TÜBİTAK, TTGV and TÜSİAD to encourage the development of new technologies or innovative products and processes in Turkey, were presented at a ceremony. After a pre-selection of entrants, 45 finalists competed for the awards in 8 categories. Esra Erdem and Volkan Patoğlu’s Special Jury Prize-winning project "AssistOn Rehabilitation Systems" draws on the synergy of robotics and artificial intelligence technologies to improve treatment efficacy, shorten recuperation times, and reduce treatment costs to make medical treatment more accessible.